Warning: The following contains intense color. Some of my Lilies popped open today! 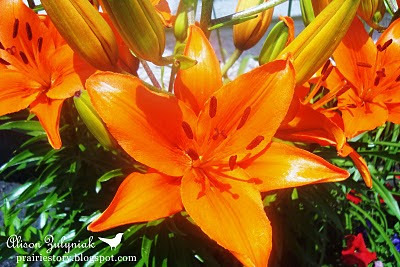 Asiatic Lilies come in many different colors, and this orange one is sometimes mistakenly called a Tiger Lily, but the Tiger has spots. This perennial has done wonderful in my front planter with full sun. It is reaching 2.5 feet tall and has many, many flowers on it this year. I'm thinking that I may have to move it or split it next year because it is getting so large! Stay tuned, my Daylilies look like they should open up in the next few days!